How Do I Find Out About Bozeman Events? – Event Calendar 2019: Art, Food, Theater, Music, Sports, Festivals, and More – Things To Do In Bozeman – What’s Happening in Bozeman, Montana This Month? Since 1973, Montana Shakespeare in the Parks has been playing Montana, Wyoming and southern Idaho parks during the summer months. The company has made significant progress in the growth of our educational outreach program, which mounted its first tour in 1993. Also, since 1992, Montana Shakespeare in the Schools (SIS), has been active as an educational outreach program during the winter months. SIS is a Montana State University (MSU) program. Join us every for Bozeman Farmer’s Market Tuesday from 5:00pm-8:00pm, from June through the 2nd week in September. Vendors from around the area bring vegetables, arts, crafts, music, food and much more! Shop and gather in support of a fun-filled family environment! The Market is run by The Friends of Bogert Park. Proceeds go to rejuvenate Bogert Park! Promote, Preserve, and Play together at Bogert Farmers’ Market! Bozeman Art Walks occur on the second Friday of the months June through September, from 6:00pm to 8:00pm at art galleries and businesses displaying artwork located along Main Street, Bozeman and at the Emerson Center for Arts and Culture. The galleries feature artists’ openings and receptions and often provide refreshments and hors doeuvres. A great place to meet Bozemanites, socialize, and view great Montana art. The Gallatin Valley Farmer’s Market is every Saturday from the 3rd week in June through the 2nd week in September and runs from 9-noon. Every thing sold at the market is homemade or homegrown. We have local growers, artists, crafters, frozen meats and prepared foods. We also accept the Bozeman Senior Center Produce Vouchers. Bozeman, Montana Music on Main scheduled bands are TBD. Every Thursday evening in July and August from 6:30pm to 8:30pm enjoy live music in downtown Bozeman. Bring the kids from 6:30pm to 7:30pm for planned activities like Kenyon Noble’s Junior Carpenter program and educational games with the Museum of the Rockies and Children’s Museum. Grab a bite to eat from food vendors that will be on site or step into a few of the downtown stores that stay open late! This interactive series of stations offers visitors a chance for a hands-on experience of the Lewis & Clark adventure. Climb a board a keel-boat, out run a grizzly bear, and see if you can lift a cradle-board like Sacajawea carried. These activities plus geography, botany, Native American culture, a much more. Christian Fagan and Mr Monk, Tony Shalhoub, at Bozeman’s Ellen Theater. 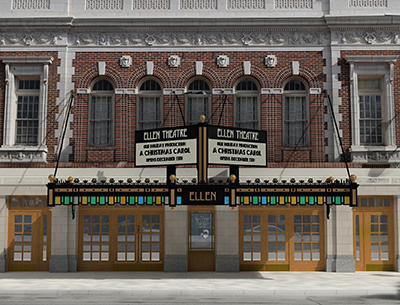 The Ellen Theater Productions Throughout the Year, 406-570-6199, Montana Theater Works, 17 W. Main Street, Bozeman, MT – What’s Happening at the Ellen? The Ellen Theatre opened for the first time on December 1, 1919, and has played many parts, including movie house, strip tease venue, vaudeville house, wedding place, high school playhouse, and now it has re-opened as Montana Theatre Works’ playhouse. Scheduled Bands are TBD. Located at 111 South Grand Avenue, The Emerson Center for Arts and Culture’s summer Lunch on the Lawn series returns for its 7th year. This year’s LOL will be better than ever with a great lineup of local and regional musical acts to entertain during your lunch hour. Also enjoy a new noon-time Farmers Market; joining the traditional food vendors, will be local farmers, Emerson artists, shop owners, crafters and gardeners. Join us for live music and fun for 7 Wednesdays in July and August at Lunch on the Lawn, a FREE local event. The MSU Spring Rodeo, hosted by MSU, is held inside the Brick Breeden Fieldhouse. Cowboys and cowgirls from the Big Sky Region will be competing for the honor of going to the college finals in Casper, Wyoming. Seven schools will be on hand for the event. Get ready for the most exciting quilt shop hop you’ve ever experienced; over 40 stores waiting to fulfill your quilting adventure! This spring marks another year for the Circle of Friends Montana Shop Hop, the largest quilting shop hop in the United States. Each year we strive to bring you the latest in quilts. The Gallatin Valley Bicycle Club (GVBC) sponsors the Gallatin Valley bike swap every year in April, which has been a huge success in the community over the past several years. Community members are welcome to sell bikes or bike-related items for a $1 commission fee per item, plus 15% of the item price, which goes to benefit the bike club. Bozeman’s annual Bike Swap is open to the public. Pow-wows are an important contemporary expression of American Indian heritage. A pow-wow is a Native American festival featuring traditional dancing, drumming and singing and traditional foods and arts and crafts. Various kinds of honor ceremonies and other spiritual ceremonies also form a part of this festival. Live Music, Film, Comedy, Plays. The Montana Outdoor Science School will be hosting the Annual Watershed Festival, The Year of the Trout, at the Bozeman Fish Technology Center. Offered free to the public, the Community Watershed Festival is made possible by business sponsors, volunteers, and other private donations. Bozeman’s Fourth of July Celebration is one of Montana’s largest fireworks display beginning at dusk. Admission with button. Buttons can be purchased from local merchants in Bozeman, or at the gate. Over 300 booths of firearms and related items, cowboy and Indian memorabilia, bits, spurs and saddles, six shooters and old rifles, western and wildlife art, furniture, vintage clothing and jewelry, knives, books, prints and photos. This show is smoke free and family orientated. The Wine Classic is an event that blends the sophistication of wine tasting with the approachable, casual, adventure of the West. The Museum of the Rockies will be hosting its annual Wine Classic from 7:00pm to 11:00pm. Guests will enjoy exquisite food and wine on the museum grounds as they celebrate local cuisine. We would love to have you come and join us for a great time at this year’s Gallatin County Fair! Enjoy the carnival and the Open Class or 4-H exhibits which include arts and crafts, gardening, floral, foods, needlework, photography, poultry and other livestock. Have fun shopping at the indoor and outdoor markets. The Headwaters Relay is a 3-day, 232 mile team relay race through the mountains and valleys of Southwest Montana. The route is 98% on dirt and two-track roads revisiting Lewis and Clark’s trek from Three Forks to Beaverhead Rock. The Relay ends at Hellroaring Creek, the ultimate source of the Mississippi River. The annual Bite Of Bozeman is the ultimate outdoor dining experience. Stroll along the entire length of Bozeman’s historic Main Street and celebrate the culinary arts of its local restaurants by sampling foods from a number of different vendors. This annual event includes three buildings with over 75 dealers setting up booths of merchandise ranging from furniture, glassware, linens, to collectibles. Our admission fee is $4.00 and covers all three days. This antique show is a fund raiser for the support of Little Bear School House Museum. Bozeman’s Sweet Pea is a festival of the arts featuring a costume ball, dining on Main Street and entertainment in Bozeman’s Lindley Park, which includes music, dance, theater and children’s activities. Family entertainment featuring the arts. Our Annual Day in the Country features mini-classes, country picnic lunch and evening lecture. Pre-registration required. Part exhibition, part Wild West show, part competition. Authentic cowboys and cowgirls dressed in 1800’s period clothing compete on horseback in a timed shooting event with 45-caliber single-action pistols for real Old West entertainment. Concessions, seating and parking is available. The Montana State University-Bobcat Club Vintage Bobcat Gala and Auction will hold a live auction of twenty hard-to-get items and a silent auction of 50-60 items. The evening event begins with a wine tasting and hor d’oeuvres and includes a bar, dinner, and other events. With mountain range views in every direction, the Bozeman Marathon and Half Marathon courses run over rivers, past farms, and on toward the finish on Main Street in downtown Bozeman. The Bozeman Full Marathon (map) starts on TBA, and the Bozeman half Marathon (map) on TBA; both finish on Main Street in historic downtown Bozeman, Montana. After the race, there will be refreshments, live music and awards. Bozeman Marathon information and registration. The John Colter Cross Country Run is held at the Missouri Headwaters State Park in Three Forks, Montana, commemorating John Colter’s escape from the Blackfeet Indians. Please join this group run for a unique and enjoyable outdoor experience. Following the Lewis & Clark Trail, the Lewis and Clark Marathon (26.2 miles) 1/2 Marathon, Marathon Relay (4 entrants each run 1/4 of the marathon), 5K run/walk, and Kids’ Runs are held to commemorate the Bicentennial of Lewis & Clark Corps of Discovery. Begins at 8:00 am at the Malmborg School on Jackson Creek Road, Bozeman. Exit I-90 at Jackson Creek Road. The mission of HATCH is to provide mentorship, education, inspiration, and recognition to the next generation of creative innovators. HATCHfest is a 501 (c)3 non-profit. The 5-day event takes place in September. During the week they showcase dozens of innovators: scientists, filmographers, musicians, architects, artists, craft-makers, with featured panel discussions and workshops in film, music, design, writing and architecture. The Bridger Raptor Festival is an annual event held in and around Bozeman Montana. The festival, which is free to the public, centers around an annual count each Fall of the largest known golden eagle migration in the United States. The Bridger Raptor Festival takes place at the Bridger Bowl ski area. This Bozeman Event is designed to raise awareness of our local homeless families and to raise funds for Family Promise of Gallatin Valley. Set-up for Cardboard Box City is 5 – 7 p.m. at Bozeman’s Bogert Park. Free pizza for all registered participants. Parade of Boxes open to public, 7 – 8 p.m. Prizes for most creative design, most money raised (individual and group), oldest and youngest participants, etc. Live rock and soul music, 8 – 10 p.m. Bring musical instruments and jam with the pros! Also, personal stories from 2 formerly homeless guests of Family Promise. Come and learn more about homelessness and how everyone can make a difference. Light breakfast served Saturday, 6 – 8 a.m. Event concludes 8 a.m., Saturday. Everyone invited! Each year, around the 3rd weekend in October, the Parent-Family Association of MSU sponsors a weekend event for the parents and families of MSU students. Over 800 people attend this popular event, which gives parents and families a chance to explore MSU and the greater Bozeman community. The 2008 activities include the Rendezvous dinner on campus, a rafting trip, a Museum of the Rockies tour, a Bobcat football game, and a scavenger hunt in downtown Bozeman. Hawk Watch International began full-season, fall migration raptor counts at this site in southwestern Montana’s Bridger mountain Range in 1991. At this time in 1992, Hawk Watch began standardized, single-site counts. Come see presentations on raptor research, ecology, and conservation at local venues, as well as live-bird programs, ID seminars, raffles, and field trips from the Bridger Bowl Lodge to the migration site. 2:00-5:00pm – Museum of the Rockies Family Halloween Party family-friendly party, guaranteed to put everyone in that creepy, crawly Halloween spirit. This annual event includes three buildings with over 78 dealers setting up booths of merchandise ranging from furniture, glassware, linens and collectibles. Our admission fee is $4.00 which will cover all three days. This antique show is a fund raiser for Little Bear School House Museum. Bring your Consignments on Friday, November 4 between 10am and 7pm. There is a cost for each item consigned. Opens to Club Members Only for first hour, Saturday, Nov 5, 9am-10am. Opens to General Public, Saturday, Nov 5, 10am-5pm – Open to Everyone. Admission $2.00 for non-BSF members. Open to General Public, Sunday, Nov 6, 10am-2pm – Open for and Free Admission for everyone. This 5k and 10K running race, held every Thanksgiving in Bozeman, MT, gives its proceeds to the Gallatin Valley Food Bank, a division of Bozeman’s Human Resource Development Council (HRDC). The Bozeman Ice Festival is a regional/national Montana ice climbing event, promoting the sport to people of all ages and abilities. Learn the necessary ice climbing skills and safe climbing techniques to enjoy this amazing winter sport! Hone those mixed-rock and ice climbing abilities! This Bozeman ice climbing festival will introduce new and old climbers to cutting edge clothing, equipment, and Montana ice climbing! Occurs both in and around Bozeman and in the Hyalite Mountains, 30-minutes south of Bozeman, Montana. 2016’s Play: Dicken’s play, A Christmas Carol, a story of the acerbic old miser, Ebenezer Scrooge, unveiling his transformation from sardonic and bitter miser to kind and gentle Englishman after visitations from specters. Downtown Bozeman’s greatest holiday tradition is its Christmas Stroll, always on the first Saturday of December. Strolling from the Emerson Cultural Center, at 4:30pm, Santa Claus works his way down Main Street with thousands in tow, singing Christmas carols and lighting the downtown holiday lights as Bozeman’s annual Christmas Stroll gets people into Bozeman’s Christmas spirit. Have your photo snapped with Santa Claus. Enjoy entertainment, holiday treats, and horse drawn wagon rides. The Downtown Bozeman Association and participating art galleries and businesses have extended the Art Walk season into winter! Many galleries feature artists’ openings with receptions , offering hors d’oeuvres and refreshments. Enjoy musical buskers, playing tunes as you stroll Bozeman’s main drag. All information contained herein is derived from sources deemed reliable, however, information is not guaranteed by Taunya Fagan Real Estate, Boutique Luxury @ ESTATE House, or other Agents or Sellers. Offering is subject to error, omissions, prior sales, price change or withdrawal without notice and approval of purchase by Seller. We urge independent verification of each and every item submitted, to the satisfaction of any prospective purchaser. Equal Housing Opportunity.